At the Maplewood-Richmond Heights school district(MRH) in planning sessions with teachers, parents, and board members, we developed our focus for an MRH education: inspiring and preparing students as scholars, leaders, stewards, and citizens. These four roles we took seriously, and we shaped a unique program for our students, a transformed education. Today if I were in the conversation, I would advocate for the addition of one more role—that of innovators. In this blog entry, we explore briefly the role of scholarship. Senge calls it “deep learning” and Schlechty calls it “profound learning,” but what it represents is a commitment to scholarship in the classroom, a willingness to pursue topics and questions over a period of time—long enough to create a sense of “expertness” with ideas, long enough to develop a theory about how seemingly disparate concepts fit together, long enough to ask questions and seek answers that require analysis and synthesis. Scholarship is difficult to attempt in many schools today because of the reform movement’s focus on achievement which usually translates to increasing test scores. Recently I visited a fourth grade classroom in a turnaround school where students were completing a worksheet on American coinage. A brief two paragraphs appeared at the top of the page and six questions at the bottom. When I visited with the teacher at the end of the period, she explained that the lesson focused on common core standards about citing evidence from a text. “So what learning was this lesson a part of?” I asked. “Ah, so you are looking at coinage from an economic perspective? Or perhaps from an historical perspective? I queried. The teacher looked puzzled. Finally she answered, “No, we’re not really studying coinage. It was just a worksheet on coinage. We don’t really study anything in social studies.” I didn’t know what to say. That last sentence had quite taken my breath away. But as I reflected on the conversation back in my hotel room that night, I realized I should not have been so surprised. I watched with great sadness as the Department of Education implemented “The Race to the Top” and sent schools across the nation scurrying up an imaginary mountain in pursuit of high achievement. And as they raced, they left behind the heavy stuff that takes energy to carry—the deep inquiry, the complex projects, the intense writing and revision, the document-based study. The top of the mountain where the air is thin, offers little room for collaboration; the work is isolated and done in bite-sized bits. The Race to the Top in 2009 and all of the similar-minded reform efforts of the last decade were aiming to promote high achievement. In fact, they decimated scholarship. In an amazing number of elementary schools there is no social studies curriculum, and the science program is tucked in some place where it doesn’t impact math and literacy. Budget cuts have eliminated the arts in many places. In far too many schools, reading programs have retreated to teacher-proof programs where teachers read scripted lessons and students fill in worksheets. Scholarship has no place in these environments. To be frank, scholarship was not a part of many school’s programs before the reform effort—particularly in poor schools where remediation carried the day. As we began our work at MRH, we surveyed the schools in the district and were struck by how dramatically different the schoolwork our students were doing was from that in the neighboring Clayton district, the wealthy suburb my assistant superintendent and I had just left. In Clayton, we didn’t pay much attention to the state tests; our students did well on them. Clayton parents expected their children to be prepared to enter Ivy League universities, and that work started in the earliest grades. Students in Clayton read books—lots of them– starting in kindergarten. They wrote daily in Writers’ Workshop. High school students had one-on-one conferences with their English teachers about their writing throughout the year. Tubs of wonderful materials to study science and social studies concepts were delivered to the elementary classroom doors. The science labs at Clayton High were stocked with amazing equipment and seemed not much different from the laboratories down the street at Washington University. The Early Childhood program was based on Reggio Emilia, the Italian preschool that has garnered international attention with its focus on scholarship and art for the youngest learners. Clayton children in all grades explored all the wonderful resources that were a part of the St Louis region—the zoo, the art museum, the arboretum, the symphony, the history museum. I knew the national and state reform efforts were supposed to address poor education in schools like MRH—but what the reform agenda accomplished in far too many places, including MRH, was substituting a new set of piecemeal solutions instead of offering children the rich academic diet that was being served next door. “How can that be? How can one third of our children need special services? Are we built on an ancient toxic waste dump or something? These numbers don’t make any sense!” I could feel my frustration rising. Years of what amounted to educational neglect had culminated in the figures staring at me from the page. Clearly that our first order of business in creating a different kind of school had to be building an understanding of scholarship and what it looked like and sounded like everywhere in our district. The task was daunting…as it is for anyone who aims for school transformation, but successful models exist all over the United States. A primary focus of transformational work must be the development of highly engaging, authentic, experiences that call on children to learn and apply basic and higher order skills to solve problems. The work must be rigorous, well-scaffolded and connected to the world in which we live. It must give children time to explore, propose, rethink and revise, collaborate, and come to an understanding of what excellence looks like. A tall order, indeed. At MRH we turned to Understanding by Design to help us begin to shape our thinking about scholarship. This curriculum design framework developed by Jay McTighe and Grant Wiggins gave us a common language for talking about teaching and learning; it offered a process for moving away from bits and pieces of learning and delving into big ideas; it helped us articulate our learning proposals from grade to grade, it put textbooks in a proper perspective as a resource; and it was respectful of the teachers’ professional knowledge. Our teachers became designers; and like architects and other design professionals, they followed certain standards but had space to create rich challenging learning agendas for children. Our work with Understanding by Design was critical to the deep changes at MRH. We spent the entire first year involving every teacher in the development of one unit of their choice. They worked in teams and were given time for research of their topic and discussion of what kind of strategies would work best to engage and challenge students within the content they had selected. Some of the teachers’ professional development time was used to visit regional resources to see how these could support our work. Suddenly the zoo, the museums, even local businesses became options for enhancing study. Teachers learned to critique each other’s work, with revision a critical to the process. The facets of understanding described by McTighe and Wiggins helped teachers expand their visions of learning. Perhaps most profound was the fact that three of the six facets focused on understandings that grew heavily from the affective realm: empathy, self-knowledge, and perspective. These were, by and large, new to our faculty and engendered much conversation about how to teach them in meaningful ways. Their conscious inclusion in the curriculum over time had a powerful impact on the culture of our district. Both teachers and children grew in their ability to discuss these facets in a story, a history lesson, at recess, or on the ball field. We had language that informed our thinking and learning experiences to broaden our understandings of how we would be in relationship to one another. Fundamental to this work was supplying each teacher a laptop. We created a system for posting the units online including all of the links to resources, and teachers could read and respond to each others’ proposals. We did gallery walks of the student work that came out of the units, commenting on the clarity of the learning outcome and the quality of the work. In that first year we began to deprivatize our practice and develop a sense of excitement and purpose in our teaching. Certainly some people decried this focus. We heard comments such as this: Your school is falling apart around you, and you choose to spend an entire year creating a small number of units of instruction. The answer was an emphatic yes, because in truth we were doing much more than that. We were changing the culture by focusing intensely on learning, recognizing the power of design to shape learning experiences, building teacher efficacy, nurturing professional collaboration, and establishing teacher and student scholarship as the primary focus of our collective efforts. We were also restoring energy and excitement to our role as educators, and many teachers rose to the occasion in remarkable ways. Others did not, and that is a story for later in the book. The dictionary definition of scholarship is this: the systematized knowledge of a learned person, exhibiting accuracy, critical ability, and thoroughness. This definition was powerful for us. We discovered our units aimed much higher when we were developing students’ scholarship than if we were just collecting interesting activities or teaching isolated standards. Scholarship required us to look at learning with a much more critical eye as to exactly what and how our students were learning. We recognized that isolated skill drill was necessary on occasion, but as a steady diet it left our students’ scholarship wanting. As we waded into increasingly sophisticated pedagogy, teachers became systems thinkers, exploring the interrelatedness of the experiences they were designing and the knowledge they were helping students weave together. A focus on scholarship can look different in different settings. Envision Schools, a consortium of charter schools in the Bay area of San Francisco, offer wonderful examples of schools where scholarship is a clear focus. The schools have garnered national recognition for innovations in performance assessment, a graduation portfolio system, and a rigorous approach to project based learning. Seventy percent of Envision students come from low-income families, but that fact has not kept them from highly successful high school careers, and almost 80 percent go on to be the first in their families to graduate from college. Envision adapted this list, adding the important outcome of “creating something that did not exist before.” Fundamental to the work at Envision Schools is the following rule of thumb: for learning to be meaningful and long lasting, it should culminate in the creating of something that never existed before. 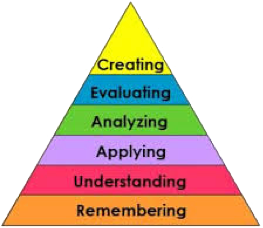 (Lenz, p. 9) Envision school founders define creativity expansively, and they refer to the revised Bloom’s taxonomy as they craft their learning plans. Creating at Envision involves a broad range of products and processes, all designed to engage students in sophisticated application of skills and understandings not well assessed with a bubble in or short answer. Perhaps one of the most impressive parts of the Envision School work is their commitment to project based work as a way to deeper learning. Anyone who has attended Buck Institute’s wonderful workshops knows that project based learning is heady and complex, learning requiring skillful teaching and real commitment. Envision Schools have made project based learning an art form among its teachers and students. The launch of a project begins not with what students will learn but what they will create. A demonstration of key knowledge and skills in which students show evidence through a product or performance that they have mastered predetermined standards or desired learning outcomes. Academic rigor and alignment with standards, allowing students to master content knowledge and skills and to demonstrate or apply that knowledge. A timeline that is short or long, ranging from a few days to several weeks, so that students learn how to benchmark and manage projects of different sizes. An engaging launch to hook students into taking on the project. Applied learning so that students think and do something new with their knowledge or skills. An authentic audience, which ensures that the students take the project seriously, challenging them to present their learning professionally and inspires their stretching for quality. High quality products and/or performances that not only provide evidence of rigorous learning, but also knocks people’s socks off. For secondary schools looking for a place to dig into scholarship, the Envision book by Lenz et.al. Transforming Schools: Using Project-based Learning, Performance Assessments, and Common Core Standards is a great place to start. With an accompanying DVD showing students’ defense of their work, the book gives enough specifics to support a deep dive into what scholarship looks like in a high school that puts it front and center. When genuine deep scholarship is front and center of a transformation effort, schools change, in part because implicit in the focus is a professionalization of teachers and their own scholarship. Teachers who aim for scholarship are not given scripts; they are coached to be designers who study their students and their content and create rich environments where critical thinking and broad inquiry are embedded in daily work. Senge, Peter. The Fifth Discipline: The Art and Practice of the Learning Organization. New York: Doubleday/Currency, 1990.